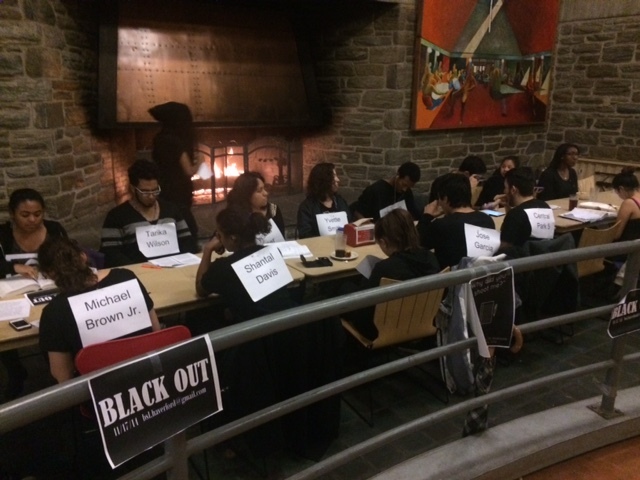 Last Monday, the Black Student League (BSL) hosted a “Blackout” in the Dining Center lobby during dinner to raise awareness about police brutality and unwarranted violence against people of color. At the event, roughly 20 students wearing all black clothing ate in silence, with the name or a picture of a victim of racially motivated violence on their back such as Michael Brown Jr., the Central Park Five, and Trayvon Martin. The goal of the Blackout, as described by BSL Executive Board member Tionney Nix ‘17, was to open a dialogue among students about such events in anticipation of the grand jury’s decision on indicting Officer Darren Wilson, who killed Michael Brown in August. “Blackout was planned by the BSL as our way of recognizing that there was a silence on campus about the recent issues of police brutality,” said Nix. Courtesy of Tionney Nix ’17. However, in the days since the event, dialogue about police brutality has taken a backseat to discussion about the anonymous response board that the BSL set up in the DC lobby. 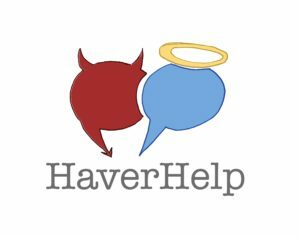 Following the event, students were asked to anonymously submit their opinions of how race is handled at Haverford to the BSL online. By Thursday morning, several anonymous comments had been printed out and posted on a bulletin board in the DC lobby. Some of the responses directly answered the prompt, while others included inflammatory statements and verbal attacks. Other responses posted on the board touched on topics including the Customs Program, the Honor Code, Haverford athletic teams, and racial and cultural tensions on campus. Reactions to the board were mixed. Others thought it served as an effective way to open a dialogue on campus. “I think it’s good that they’ve opened it up to discussion, because people clearly care about it,” said Daniel Waranch ‘16. Nix agreed with this line of thought, saying that the response board successful in engaging different parts of the student body in the discussion about race on campus. However, she did acknowledge criticisms of the board’s anonymity. 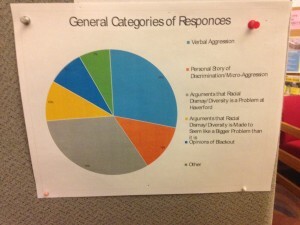 BSL’s breakdown of the student responses. 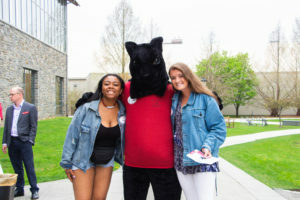 Issues of racial diversity have been felt by the Bi-College community this school year, beginning with the Confederate flag controversy at Bryn Mawr College in September. 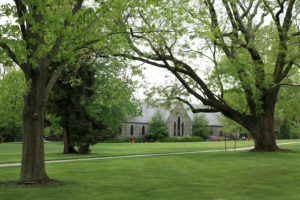 To deal with issues of inclusion and diversity, Haverford has recently convened a task force of students, faculty, and staff, as announced by President Daniel H. Weiss on November 5. 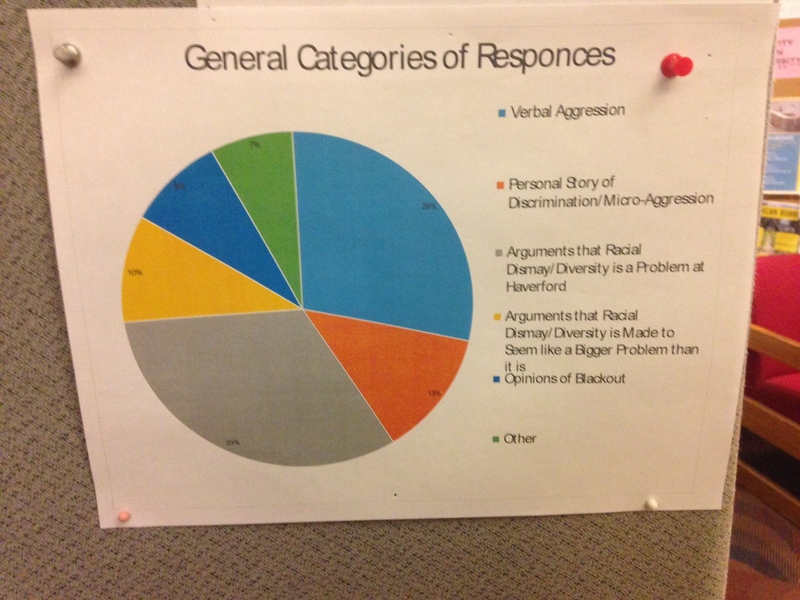 Weiss also shared his thoughts on the BSL event and response board. I think the comments that an anonymous board isn’t a good way to communicate are oversimplifying-isn’t this the exact same thing we do with Honor Code ratification? People are invited to submit their thoughts, which are then displayed anonymously to the school. I’m interested to read people’s objections to the board, but I don’t think its public and anonymous nature should be one of them if the same critiques aren’t applied to Honor Code ratification. 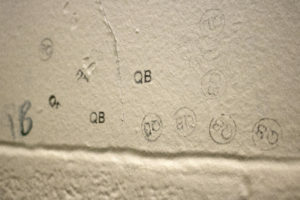 As an alumni, I’m discouraged to see that so little progress has been made. These are the exact same debates (and anonymous commenting) we had in the 90s.